Mrs R scratched both her legs on a wicker basket whilst at home. The patient attended her local surgery and received treatment based on traditional wound management theory of moist wound healing; this continued for a period of four years with no visible improvement. The patient attended a wound clinic on a weekly basis and had a variety of dressings applied to her original wounds, the final dressings used were multi-layer compression bandages. The original wound sites were scratches however as time progressed with the variety of dressings used on the patient this resulted in chronic leg ulcers on both legs. 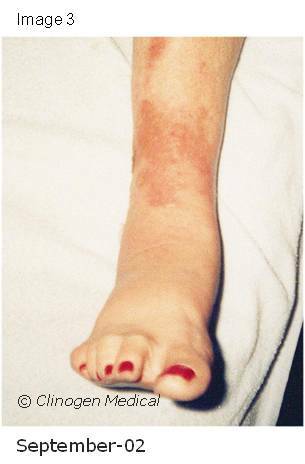 The main problems with treating this patient with multi-layer compression bandages renewed on a weekly basis resulted in high levels of exudate remaining at the wound site; as chronic wound exudate is alkaline this caused trauma, maceration and inflammation to the periwound skin and led to the breakdown of the area. After this time she began a patient controlled regimen using both Youki Bio-Cell Spray or her chronic wounds and protein-rich Youki Skin Repair Cream for fragile, inflamed periwound skin. The results below show the progress of healing over a period of 10 weeks on her right leg and ankle. The regimen consisted of the Youki Bio-Cell Spray being applied to the wound site (Image 1) 8 times a day for the first 30 days and then reduced to 6 times a day evenly throughout the day. The periwound skin was treated using Youki Skin Repair Cream which helped to rehydrate, nourish and strengthen the skin. The main principle was for the patient to keep the wound uncovered as much as possible and to follow the seven key principles outlined above. When the patient needed to dress the wound, a sterile gauze dressing to act as a barrier to the elements was used. As the wounds began to progress through the phases of healing in a dry environment, the wound did not resemble what is traditionally expected when following Winter’s (1962, 1963) principles of moist wound healing. 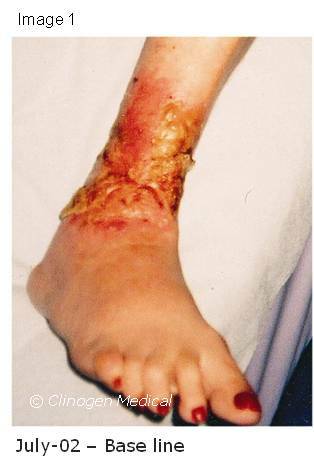 When the wound began to heal, the wound bed started to dry and the amount of exudate produced began to reduce. Any exudate that leaked into the periwound skin was wiped away from the skin so that it would not cause damage to the periwound skin. The next indication that was the formation of thick layer of protein film over the wound bed. Our observations showed that beneath the thick film the wound was beginning to granulate and epithelialisation had started. As the wound healed the patient continued to use the Youki Skin Repair Cream on the surrounding skin to ensure that this strengthened and supported remodelling of the edges of the wound site. Once the wound was fully healed it was recommended that the patient continue use of the cream to minimise the risk of scarring at the wound site and periwound skin. The protocol meant that the patient was in control of her own wound management with periodic visits to us to review the healing process. Initial application was spraying the wound site 8 times a day until a thick film formed over the wound site, and the use of protein-rich skin repair cream 4 times a day on the fragile and traumatised skin surrounding the ulcer. This process continued until full healing was achieved (Image 3).